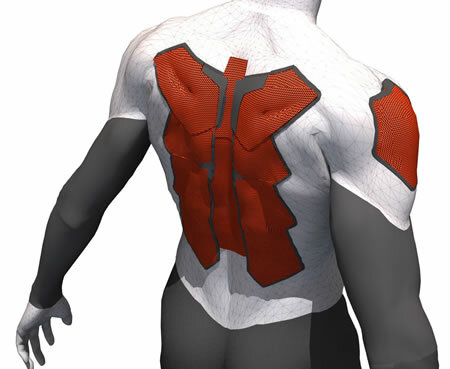 DEFLEXION shock absorbing material is a Dow Corning product that provides would-be superheroes (and athletes) with a variety of protection textiles. When Dow Corning® S7-005 is impacted the impact energy is dissipated across the surface away from the point of contact thus reducing the forces transmitted through to the body. Depending on the number of layers the force can be spread over two or three times the normal surface area. This is a known feature of certain silicone polymers due to their polymeric architecture. Works well in soccer shin guards, exceeding European shin guard standard EN13061:2001. It can be stylishly incorporated into a garment such as a base layer shirt, it can be designed to create protective equipment, like a soccer shin guard, or it can be incorporated into protective cases for delicate equipment. Because this high performance fabric is flexible, it can be cut and sewn directly into clothing, eliminating the need to insert uncomfortable padding. It can be layered, so garments can be customized with increased levels of protection for specific areas. Further, our sports textiles are much less bulky than hard armor, allowing for more fashionable and comfortable designs that still provide the needed protection. These protective textiles provide the comfort that users want – premium fit, freedom of movement, heat minimization, and washability. Dow Corning is also trying to position DEFLEXION as a good choice for the protection of laptops and other electronic devices. Read more at Dow Corning DEFLEXION website; thanks to an anonymous reader for writing in. '...a high-efficiency filter and heat-exchange system.' - Frank Herbert, 1965. Look ma, my room is clean! I can hear you now. 'He unlaced her shoe and glanced at its readout.' Bruce Sterling, 1988.